Therapeutic tumor vaccination with viral vectors or naked DNA, carrying the genetic code for tumor-associated Ags, critically depends on the in vivo transduction of dendritic cells (DC). Transfection of predominantly nonprofessional APC and only small numbers of DC may hamper proper T cell activation. Aim of this study was, therefore, the targeted, selective, and enhanced in situ transduction of DC. A human skin explant model was used to explore targeted transduction of cutaneous DC after intradermal injection of a bispecific Ab conjugate to link adenoviral (Ad) vectors directly to CD40 on the DC surface. A significantly enhanced transduction efficiency and selectivity, and an increased activation state of migrating DC were thus achieved. Moreover, DC transduced by CD40-targeted Ad maintained their Ag-specific CTL-stimulatory ability for up to 1 wk after the start of migration, in contrast to DC transduced by untargeted Ad, which had lost this capacity by that time. Because DC targeting in vivo might obviate the need for the in vitro culture of autologous DC for adoptive transfer, CD40-targeted Ad vectors constitute a promising new vaccine modality for tumor immunotherapy. For the generation of effective tumor-specific T cell responses, appropriate Ag presentation is an essential requirement. Tumor-associated Ags (TAA)4 are often self Ags, to which a considerable immunological tolerance or ignorance is maintained (1). At present, activated dendritic cells (DC) are the most powerful tools available to overcome these suppressive conditions. DC-based vaccination with specific TAA is therefore a promising approach to cancer immunotherapy (1). Autologous DC, cultured from CD14+ or CD34+ precursor cells and genetically modified in vitro to express TAA, have been shown to constitute an effective therapeutic vaccine (1, 2, 3). In vitro transduction of DC has been achieved through the use of mRNA, DNA, or viral vectors (1). However, the in vitro generation, transduction, and subsequent adoptive transfer of autologous DC in a clinical setting present a considerable logistic challenge. A less laborious and more easily applicable alternative would be the direct immunization of patients with DNA or viral vectors encoding TAA. The feasibility of this approach has been demonstrated by in vivo tumor rejection studies in mice (4, 5, 6, 7, 8, 9). The efficacy of such a genetic immunization depends on the direct in vivo transfection and activation of DC (4, 5, 8). Genetic immunization usually results in the massive transduction of nonprofessional APCs resident in the injected tissue (e.g., keratinocytes and fibroblasts), whereas only very small numbers of DC are transduced, undergo maturation, and migrate to the lymph nodes (LN) draining the vaccination site (4, 7, 9, 10). Transduction of large numbers of nonprofessional APC and only small numbers of properly activated and migrating DC may lead to the induction of specific tolerance either by T cell anergy or even by clonal deletion of specific CTL (11). Moreover, the transduction of improperly activated DC may contribute to the maintenance of tolerance rather than T cell activation (12). Ligation of CD40 molecules on the surface of DC has been identified as a critical signal for the effective priming of CTL and the generation of protective antitumor immunity (13, 14, 15). The aim of this study was therefore to achieve a selective and enhanced in situ transduction of DC, while at the same time ensuring proper DC maturation through CD40 stimulation. DC infected by TAA-encoding adenoviral (Ad) vectors have been used successfully to generate antitumor T cell responses (2, 16). Although Ad vectors exhibit a broad tropism, retargeting of Ad vectors, both in vitro and in vivo, has led to the selective infection of specific cell types (17). This has successfully been achieved through the use of bispecific Ab conjugates, which block binding of Ad to its natural receptor (the coxsackie-adenovirus receptor (CAR)) and redirect Ad to alternative receptors (18, 19, 20). We previously reported an enhanced in vitro transduction efficiency of monocyte-derived DC (MoDC) by retargeting Ad, through a bispecific Ab conjugate, to CD40 on the cell surface (21). Moreover, a simultaneous CD40-dependent maturation of the transduced DC was observed, as evidenced by an increased expression of CD83, MHC, and costimulatory molecules, by the production of IL-12, and by an increased T cell stimulatory capacity in an allogeneic MLR (21). The DC-activating properties intrinsic to the employed CD40-targeted Ad vector, together with the reduced need to administer high titers of Ad to obtain a given expression level of the gene of interest in the DC, make this an attractive in vivo gene delivery system for immunotherapy. In the present study, we have determined the utility of this method for the in situ gene transfer to DC through intradermal (i.d.) injection of the CD40-targeted Ad vectors in a human skin explant model. Ex vivo skin explant cultures were previously used as a model system to study migrational patterns of skin-derived DC and shown to be representative of active migration of dermal and epidermal (i.e., Langerhans cells) DC through lymph vessels to the skin-draining LN (22, 23). Because vaccine administration through the skin affords excellent tumor protection (6, 24), we have selected this human model system to demonstrate targeted and enhanced transfer of Ad vectors to migrating DC, as well as their increased maturation and Ag-specific CTL-stimulatory ability, through a CD40-targeting Ab complex. The culture medium used was IMDM (Life Technologies Laboratories, Paisley, Scotland) supplemented with 50 U/ml penicillin-streptomycin, 1.6 mM l-glutamine, 0.01 mM 2-ME, and 5% pooled, complement-inactivated, normal human pooled serum (HPS; Centraal Laboratorium van de Bloedtransfusiedienst, Amsterdam, The Netherlands). GM-CSF (Schering-Plough, Madison, NJ) and IL-4 (Centraal Laboratorium van de Bloedtransfusiedienst), diluted in serum-free IMDM without supplements (i.e., plain medium), were used for i.d. injection. Human skin specimens were obtained after informed consent from patients undergoing corrective breast or abdominal plastic surgery. Cytokines and/or Ad vectors were injected into the dermis with a MicroFine insulin syringe (0.33 (29G) × 12.7-mm needle; BD Biosciences, Franklin Lakes, NJ) in the indicated amounts and in a total volume of 20 μl. At the site of injection, a 5-mm urtica appeared and an exact punch biopsy of 6 mm was taken. The biopsy was lifted from the specimen with a forceps, and with scissors the dermis was cut at a depth of 2–3 mm to obtain skin explants. For immunohistochemical analysis, skin explants were cultured at air-medium interface with the epidermal side up in a six-well culture plate (Costar, Corning, NY) on sterilized stainless steel grids covered with a filter (Millipore, Bedford, MA; 45 μm), at 37°C in 5% CO2-containing humidified air. At the indicated time points, the explants were harvested, snap frozen, and stored in liquid nitrogen. For the migration assay, the skin explants (12–20 samples/condition) were placed directly in 1 ml culture medium (floating with epidermal side up) in a 48-well culture plate (Costar). At the indicated time points, the explants were discarded, and the medium, containing migrated cells, was harvested and pooled per test condition. Absolute numbers of migrated DC were counted in hemocytometers using trypan blue exclusion, or with Flow-Count fluorospheres (Coulter, Miami, FL), following the manufacterer’s instructions, and recalculated to migrated DC number per skin explant. FACS analyses, MLR, or CTL activation experiments were subsequently performed. The used replication-defective recombinant type 5 adenoviruses (with deletion of the E1 and E3 regions), encoding β-galactosidase (β-gal) with a nuclear localization sequence (Ad-lacZ) or the green fluorescent protein (Ad-GFP), both under the control of CMV promoters, were produced, purified, and titered, as previously described (20, 21). An E1-deleted Ad5 virus encoding the Haeminfluenza matrix protein M1 (Ad-M1) was kindly provided by C. Rickards and G. W. Wilkinson (University of Wales, Cardiff, U.K.). The anti-CD40/anti-Ad (Fab anti-CD40)- and anti-epidermal growth factor receptor (EGFR)/anti-Ad (Fab anti-EGFR)-bispecific Ab conjugates, consisting of IgG1 mAbs targeting CD40 or the EGFR and Fab binding the Ad fiber knob, were also prepared, as previously described (21). To determine the amount of Fab anti-CD40 needed per given number of viruses for the optimal transduction of DC, the retargeting conjugate was titrated with Ad-GFP at a multiplicity of infection of 100 and used to infect MoDC, as described previously (21). Thus, 108 PFU of Ad was added to 833 ng Fab anti-CD40 and incubated at room temperature for 30 min before injection into the skin explants or addition to MoDC. Equivalent and effective amounts of the Fab anti-EGFR conjugate were similarly determined with EGFR+ target cells and used as a control for Fc-mediated targeting (21). Ad vectors were preincubated with appropriate amounts of the Fab anti-CD40 or Fab anti-EGFR for 30 min at room temperature in serum-free plain medium. Skin explants, previously injected with cytokines or plain medium and cultured with the epidermal side up on filter-covered grids at the air/medium interface over a period of 24 h, were subsequently injected with the indicated amounts of Ad or plain medium in a total volume of 10 μl using a MicroFine insulin syringe (0.33 (29G) × 12.7-mm needle; BD Biosciences). For immunohistochemical analysis, the explants were further cultured on filter-covered grids. Alternatively, the explants were placed in 1 ml culture medium (floating with epidermal side up) in a 48-well culture plate (Costar) and further cultured as indicated, before migrated DC were harvested. Cryostat sections of 4 μm were cut and placed on poly(l-lysine)-coated slides, acetone fixed for 10 min, preincubated with normal rabbit serum (1:20; CLB, Amsterdam, The Netherlands) for 10 min, and incubated for 1 h with primary mAbs directed against CD83 (1:20; Immunotech, Marseille, France), CD1a (1:20; Immunotech), CD40 (1:100; Serotec, Oxford, U.K.), or with appropriate isotype control Abs. Subsequent incubation with rabbit anti-mouse biotin conjugate (1:150; DAKO, Glostrub, Denmark) for 30 min was followed by incubation with HRP-streptavidin complexes (1:500; DAKO). Staining was then visualized with 3-amino-9-ethyl-carbazol (ICN Biochemicals, Aurora, Ohio) in the presence of hydrogen peroxide. Slides were counterstained with hematoxylin and mounted. For the enzymatic staining of cells transduced with the lacZ gene encoding for β-gal, slides were incubated with β-gal staining solution (Boehringer Mannheim, Mannheim, Germany) for 12–72 h at 37°C after fixation with 2% formaldehyde and 0.2% glutaraldehyde in PBS for 15 min. For phenotypic analysis of β-gal-positive cells, cryostat sections were incubated for 10 min with 10% HPS, followed by CD1a-PE (Immunotech) or IgG1-PE isotype (BD Biosciences) for 60 min. Subsequently, two investigators independently counted stained cells in 10 ×400 magnification fields using a fluorescence microscope. Cells were incubated on ice for 30 min in PBS with 0.1% BSA and 0.01% NaN3, in the presence of appropriate dilutions of FITC- or PE-labeled mouse mAbs to CD83, CD11c (Immunotech), CD1a, CD83, CD86, CD54, CD40, HLA-ABC (BD PharMingen, San Diego, CA), CD14, CD80, and HLA-DR (BD Biosciences), or with unconjugated mAbs to CMRF-44 (a kind gift of D. Hart, Brisbane, Australia), to Langerin (Immunotech), or to CCR7 (BD PharMingen). A second incubation step was performed for the unconjugated mAbs with FITC-labeled goat anti-mouse Abs (Centraal Laboratorium van de Bloedtransfusiedienst). The cells were subsequently analyzed, using a FACStarPlus and CellQuest FACS analysis software (BD Biosciences). MLR was performed with the migrated skin DC. DC were added as stimulator cells to round-bottom 96-well tissue culture plates (Costar) at graded doses, reflecting the indicated responder-stimulator ratios. Allogeneic plastic nonadherent PBL, prepared as previously described (21), were used as a source of responder cells, and 1 × 105 lymphocytes/well were added to the migrated skin DC. Stimulations were performed in duplicate or triplicate. The cells were cultured for 5 days in medium containing 10% FCS (Life Technologies). During the last 18 h of culture, [3H]thymidine was added (0.4 μCi/well; Amersham, Aylesbury, U.K.), after which the cells were harvested onto fiberglass filters and [3H]thymidine incorporation was determined using a flatbed scintillation counter. Autologous heparinized blood (40 ml) was taken from skin donors after informed consent, and PBMC were isolated as previously described (21). From plastic-nonadherent PBMC (i.e., monocyte depleted), CD8+ CTL were isolated using MACS magnetic bead separation, according to the manufacturer’s protocol (CD8+ T cell isolation kit; Miltenyi Biotec, Bergisch Gladbach, Germany). Migrated cutaneous DC, either mock infected (through i.d. medium injection) or in situ Ad-M1 infected (untargeted or through CD40 targeting), were harvested and used as stimulator cells. A CTL culture was started, incubating the CD8+ T cells together with the migrated skin DC from different in situ Ad-targeting conditions at a ratio of 10:1 (5 ng/ml hIL-7 added at day 0 (Genzyme, Cambridge, MA)), for 1 wk at 37°C and 5% CO2. To evaluate the activation of M1-specific CTL, an IFN-γ ELISPOT assay was performed. Multiscreen 96-well filtration plates (Millipore) were coated for 3 h at room temperature or overnight at 4°C with the mAb 1-D1K (50 μl, 15 μg/ml in filtered PBS; Mabtech, Nacka, Sweden). Plates were washed six times with serum-free medium and subsequently blocked with filtered complete medium with 10% FCS for 30–60 min at room temperature. Autologous MoDC, cultured over the course of 5 days from plastic-adherent monocytes in the presence of GM-CSF and IL-4 as previously described (21), were infected with either a wild-type vaccinia virus (i.e., control wild-type vaccinia virus) or a vaccinia virus encoding the Haeminfluenza matrix protein M1. One donor was found to be HLA-A2 positive (by FACS analysis), and T2 cells (obtained from American Type Culture Collection, Manassas, VA) were therefore loaded overnight with either E7 peptide (i.e., control peptide, containing the HPV-16 E7-derived HA-A2-binding epitope aa 11–20) (50 μg/ml) or M1 peptide (containing the M1-derived HLA-A2-binding epitope aa 58–66) (50 μg/ml). The vaccinia virus-infected MoDC or peptide-loaded T2 cells were used as stimulators. The CTL effector cells (2.5 × 104 and 1.25 × 104 per well, in duplicate) were incubated overnight with the different stimulator cells (1 × 104 per well) at 37°C in an incubator with a 5% CO2 humidified atmosphere. The cells were discarded, and the plates were washed six times with filtered 0.05% Tween 20 in PBS (PBS-T). A total of 50 μl of the mAb 7-B6-1 (1 μg/ml in filtered PBS; Mabtech) was added to each well, and plates were left at room temperature for 2–4 h. After six washes with PBS-T, 50 μl streptavidin-alkaline phosphatase (1/1000 diluted in PBS; Mabtech) was added to each well, and plates were left at room temperature for 1–2 h. After six washes with PBS-T, 50 μl alkaline phosphate reagent (AP conjugate substrate kit; Bio-Rad, Hercules, CA) was added and left for 15 min to 1 h until spots had developed. The reaction was stopped by washing with tap water. Spots were counted using an automated ELISPOT plate counter (AID, Strassberg, Germany) and recalculated to a standardized frequency/100,000 effector CTL. Transduction efficiencies, transgene expression levels, and absolute numbers of (transduced) DC were compared after infection with untargeted or targeted Ad vectors, using the paired Student’s t test (two sided); differences were considered significant when p < 0.05. The usefulness of CD40 targeting for the selective transduction of DC in the skin critically depends on the relative expression levels of CD40 on the target DC as compared with other cell types with the ability to express CD40 (25). Immunohistochemical examination of fresh skin explants revealed a complete lack of CD40 expression both in the epidermis and the dermis (Fig. 1⇓). To achieve selective up-regulation of CD40 on DC, GM-CSF was i.d. injected before excision and subsequent culture of the skin explants. Injection of 100 ng GM-CSF led to optimal activation of DC as judged on the basis of CD83 and CD40 expression (range tested: 50–300 ng GM-CSF); up-regulation of both markers was observed in the epidermal and particularly in the dermal layers with an optimum at 24 h after injection (Fig. 1⇓). Injection of plain medium was also found to induce a certain amount of CD83 and CD40 expression after 24 h of culture, although to a lesser extent than the injection of GM-CSF (Fig. 1⇓). At 24 h of culture, abundant CD1a expression, which (in contrast to CD40 and CD83) can also be found on immature DC, was observed both in epidermis and dermis (Fig. 1⇓). The preferential localization of CD40 and CD83 in the dermis at this time may reflect migration of these mature DC from the epidermis. In keeping with our findings for MoDC (21), the cutaneous DC did not express the primary Ad receptor CAR, but did express the integrin αvβ5, which acts as coreceptor and mediates Ad internalization (data not shown). By providing an alternative receptor to CAR (i.e., CD40) and with the presence of the Ad coreceptor (αvβ5), all conditions were thus met for transduction of DC by CD40-retargeted Ad. Intradermal injection of medium with or without GM-CSF, followed by 24 h of culture, induces maturation of dermal and epidermal DC in human skin explants. Expression is shown of CD83, CD40, and CD1a in the epidermis and the dermis of skin explants, before and 24 h after i.d. injection of medium or 100 ng GM-CSF (magnification ×100). Skin explants were injected i.d. with 100 ng GM-CSF in combination with an unconjugated adenoviral vector encoding lacZ (Ad-lacZ) or with Ad-lacZ complexed to a chemically linked bispecific Ab conjugate, directed to the fiber knob region of the Ad capsid and to CD40 (Fab anti-CD40). The explants were harvested and snap frozen 48 h after i.d. injection, allowing for an additional 24 h after optimal CD40 expression levels had been reached to ensure expression of the gene of interest. β-Gal-expressing cells were visualized and scored on cryosections. The optimal dose of Ad-lacZ was determined to be 108 PFU/injected biopsy (range tested 106-109 PFU). Injection of Ad-lacZ resulted in the transduction of a high number of cells within the dermis, but not in the epidermis (Fig. 2⇓A). Similarly, the injection of Fab anti-CD40-complexed Ad-lacZ only led to the transduction of cells in the dermis. However, CD40 targeting of Ad resulted in a drastic reduction in the number of transduced cells (Fig. 2⇓A), indicating an effective block of the natural tropism of the Ad vector. 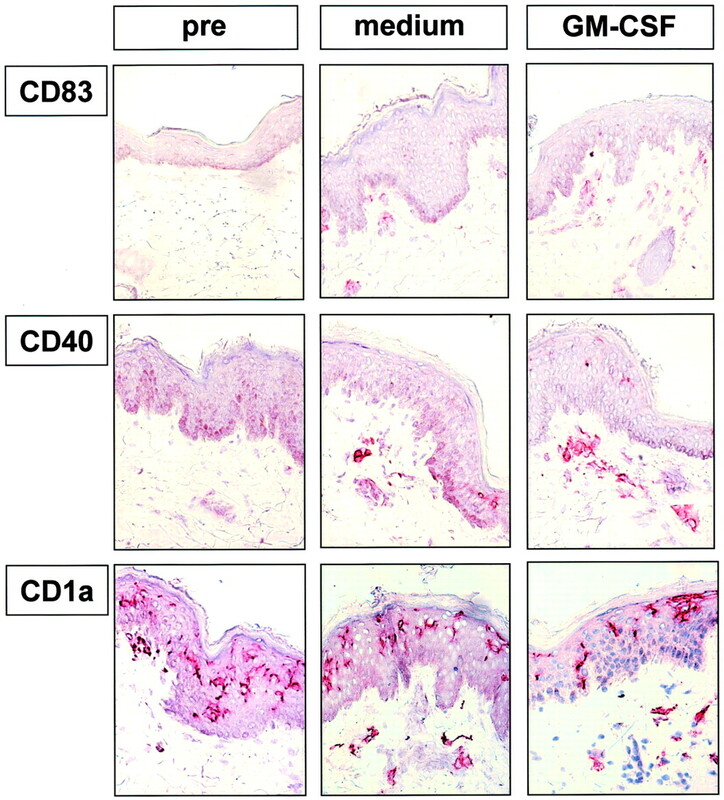 A, Intradermal CD40 targeting reduces the number of Ad-transduced cells in skin explants. Nuclear expression is shown of β-gal at 48 h after i.d. injection of 100 ng GM-CSF and 108 PFU-untargeted (Ad) or CD40-targeted (CD40-Ad) Ad-lacZ, magnification ×100 (inserts ×400). B, CD40 targeting of Ad results in a more selective transduction of CD1a+ DC in the dermis of skin explants. Double staining of β-gal and CD1a was performed. Expression in the dermis is shown of β-gal and of CD1a (PE labeled), after i.d. injection of GM-CSF (100 ng) and 108 PFU Ad-lacZ (Ad) or of 108 PFU Ad-lacZ complexed to the CD40-targeting conjugate (CD40-Ad) (magnification ×400). C, Quantitation of the number of CD1a-negative (open bars) or CD1a-positive (closed bars) β-gal+, transduced cells in the dermis of the skin explants, injected with untargeted Ad (Ad), or CD40-, or EGFR-targeted Ad (CD40-Ad and EGFR-Ad, respectively) (absolute numbers counted in 10 ×400 magnification fields). Means and SDs are shown from three experiments. Numbers of β-gal-positive cells were counted by microscopic examination in 10 randomly chosen high power fields. Double staining with a PE-labeled Ab demonstrated almost all (typically >99%) of the untargeted Ad-transduced cells to be CD1a negative (Fig. 2⇑, B and C). In contrast, injection of Fab anti-CD40-complexed Ad-lacZ resulted in a substantial increase in the proportion of CD1a+ transduced cells (at a mean of 44%; Fig. 2⇑, B and C), thus revealing a more selective targeting of the Ad vector to DC. In parallel, Ad-lacZ complexed to Fab anti-EGFR (a bispecific Ab conjugate (of the same isotype as the Fab anti-CD40)-targeting Ad to the EGFR) was also injected into skin explants. No β-gal activity was detected using this conjugate (Fig. 2⇑C), indicating effective blocking of the natural tropism of Ad and excluding the possibility of Ad uptake by binding of Abs in the conjugate to Fc receptors on the surface of DC. These data indicate that the increased selectivity of cutaneous DC transduction is due to specific binding to CD40. To further determine the effect of CD40-mediated Ad infection on DC transduction efficiency and maturation, migrated cutaneous DC were studied. Spontaneous migration of DC was observed from skin explants, which were i.d. injected with plain medium and cultured for 48 h while floating in 5% HPS-containing culture medium. Most of the cells harvested from the explant cultures at 48 h had the typical morphologic DC appearance of large cells, with a lobulated nucleus and membrane invaginations and processes (Fig. 3⇓A). This translated into characteristic high side (SSC) and forward scatter (FSC) properties, as measured by flow cytometry (Fig. 3⇓B). Comigrating T cells were also observed (see Fig. 3⇓A). FACS analysis showed that the migrated skin DC were positive for the DC markers CD1a and CD11c, and expressed HLA-DR, -ABC, CD40, CD54, CD80, and CD86 (Fig. 3⇓C). A majority of the DC showed weak expression of Langerin, suggesting that most of the migrated cutaneous DC were epidermally derived Langerhans cells (Fig. 3⇓C). Only a small subset of migrated cells within the SSC/FSC DC gate expressed the monocyte marker CD14. All migrated DC expressed the early DC maturation marker CMRF-44, but about one-half of these also expressed the late maturation marker CD83, indicating the presence of a less and a more mature migrated DC subset (Fig. 3⇓C). CD83 expression always coincided with the expression of CCR7 (Fig. 3⇓C), indicating the ability of fully matured cutaneous DC to home to the paracortical T cell areas of LN. Morphology and phenotype of DC migrated after 48 h from human skin explants. A, Morphology of cells migrated from skin explants; cells were stained for HLA-DR expression (magnification ×100). B, Migrated DC from skin explants, measured by FACS, can be gated as a discrete cell population on the basis of high SSC and FSC properties. C, Phenotype of DC migrated 48 h after i.d. injection of plain medium, determined by FACS analysis. The first three histograms denote isotype controls. 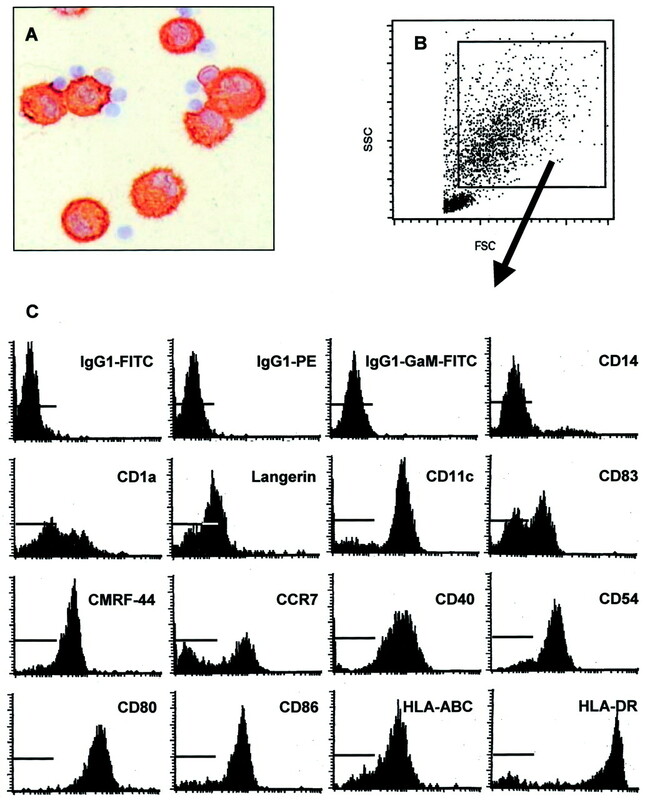 FITC-conjugated mAbs used, CD14, CD83, CD40, CD86, and HLA-DR; PE-conjugated mAbs, CD1a, CD11c, CD54, CD80, and HLA-ABC; indirect staining through goat anti-mouse FITC of unconjugated mAbs, Langerin, CMRF-44, and CCR7. Representative results from one of five experiments are shown. 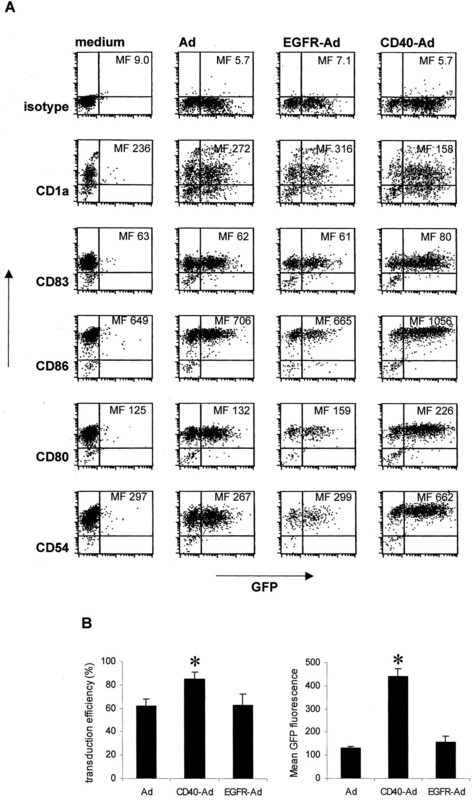 GM-CSF induced CD40 expression, which was accompanied by DC maturation (judged on the basis of CD83 expression; see Fig. 1⇑). Because DC maturation has previously been reported to interfere with Ad infection (26), we studied the effect of cytokine-induced maturation on the transduction efficiency of migrated cutaneous DC by untargeted or CD40-targeted Ad. We compared the effects of i.d. injection of plain medium, 100 ng GM-CSF, or 100 ng GM-CSF with 1000 U IL-4, before the 48-h culture of the skin explants. Under all these conditions, CMRF-44 expression was found on the migrated DC, indicative of early maturation. Further maturation was induced after the i.d. 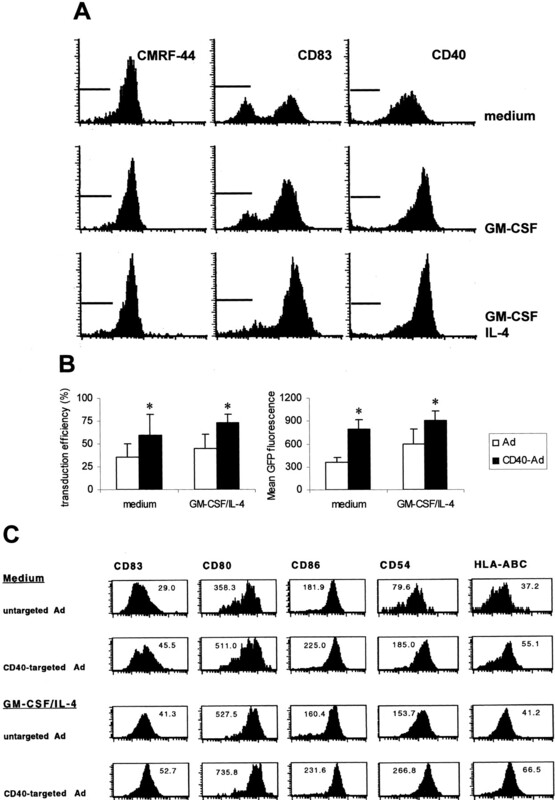 injection of GM-CSF and/or IL-4, evidenced by up-regulation of CD83 and CD40 expression (Fig. 4⇓A). The most mature phenotype was consistently achieved through the simultaneous injection of GM-CSF and IL-4 (Fig. 4⇓A). Accordingly, highest numbers of migrating DC were always found after i.d. injection of GM-CSF in combination with IL-4 (significant in comparison with injection of medium; see Table I⇓). The ability of untargeted or CD40-targeted Ad to infect cutaneous DC in situ in a mature state after GM-CSF and IL-4 injection was subsequently compared with the more immature control condition after injection of plain medium. CD40-targeted Ad infection efficiency in relation to maturation state of cutaneous DC. A, Expression of the DC maturation markers CMRF-44, CD83, and CD40 on DC, migrated from human skin explants, 48 h after i.d. injection of plain medium, GM-CSF (100 ng), or GM-CSF (100 ng) and IL-4 (1000 U). B, Skin explants were i.d. injected with either plain medium (n = 5) or GM-CSF (100 ng)/IL-4 (1000 U) (n = 7), cultured on rafts during 24 h, and then i.d. injected with 108 PFU of untargeted (open bars) or CD40-targeted Ad-GFP (closed bars), and placed directly in culture medium; 24 h later, migrated cells were harvested and analyzed for GFP expression by FACS. Transduction efficiencies (in %) and GFP expression levels (in mean fluorescence) are shown. Asterisks denote significant differences between the untargeted and CD40-targeted conditions in paired, two-sided t tests; medium, transduction efficiencies, p = 0.005 and mean GFP fluorescence, p = 0.005; GM-CSF/IL-4, transduction efficiencies, p = 0.0003 and mean GFP fluorescence, p = 0.005. C, DC migrated from skin explants, preinjected with either medium or GM-CSF/IL-4 and subsequently with untargeted or CD40-targeted Ad-GFP, were labeled with PE-conjugated Abs to CD83, CD80, CD86, CD54, and HLA-ABC, and analyzed by FACS; mean fluorescence levels for the indicated markers are listed. One representative experiment of four is shown. Skin explants were i.d. injected with either plain medium or medium containing GM-CSF and IL-4, and cultured on nitrocellulose filter rafts at the medium/air interface (see Materials and Methods) for 24 h to allow for DC maturation before i.d. injection of 108 PFU of untargeted or CD40-targeted Ad vectors encoding the GFP. As was found for medium and GM-CSF (Fig. 1⇑), at this time CD40 expression on DC in situ was found to be optimal (data not shown). The explants were subsequently placed directly into culture medium and cultured for another 24 h, after which migrated DC were harvested and analyzed by FACS. Significant and comparable increases in transduction efficiency of migrated DC by CD40 targeting of Ad were observed in both test conditions (Fig. 4⇑B). Following medium injection, Ad administration led to a mean transduction efficiency of 35.3% (range 14.9–47.7%), while CD40 targeting increased the mean transduction efficiency to 59.0% (range 30.0–85.6%) (n = 5, p = 0.005). Corresponding transduction efficiencies after GM-CSF and IL-4 injection were 44.6% (range 16.1–58.0%) and 73.4% (range 59.0–84.0%), respectively (n = 7, p = 0.0003). Similarly, expression levels of the transduced GFP gene were significantly increased through CD40 targeting (Fig. 4⇑B). FACS analyses of migrated cutaneous DC revealed up-regulation of maturation markers after CD40 targeting of Ad in situ. Although DC migrating from medium- and GM-CSF/IL-4-injected skin explants already displayed a (partially) mature phenotype on the basis of CD83 expression (Fig. 4⇑C), this could be further up-regulated in both cases by the injection of CD40-targeted, but not of untargeted Ad vectors (Fig. 4⇑C). A simultaneous up-regulation of CD80, CD86, CD54, and HLA-ABC accompanying CD40 targeting was also observed (Fig. 4⇑C). CD40 targeting of Ad consistently led to the migration of significantly higher numbers of transduced, GFP-expressing DC, with the highest absolute number of transduced DC migrating from the explants preinjected with GM-CSF and IL-4 (see Table II⇓). To exclude the possibility of Fc receptor-mediated effects, the targeting experiments in GM-CSF/IL-4-prematured skin explants were repeated with the EGFR-targeting construct, containing a mAb of the same (IgG1) isotype as the CD40-targeting conjugate. As shown in Fig. 5⇓, enhanced transduction efficiency and transgene expression levels were specific to CD40 targeting and not found after EGFR targeting. Moreover, Fig. 5⇓A demonstrates that all transduced cells uniformly expressed the tested DC markers, but up-regulation of maturation and costimulatory markers was only observed after CD40-targeted transduction. Increased transduction efficiency and maturation of migrated cutaneous DC after targeting of Ad are CD40 mediated and not Fc dependent. A, Skin explants were i.d. injected with GM-CSF (100 ng)/IL-4 (1000 U), cultured on rafts for 24 h, and then i.d. injected with plain medium, 108 PFU of untargeted, EGFR-targeted, or CD40-targeted Ad-GFP, and placed directly in culture medium; 24 h later, migrated cells were harvested and analyzed for GFP and DC marker expression by FACS. Mean fluorescence (MF) levels for the isotype or indicated markers are listed in each of the dot plots. B, Transduction efficiencies (in %) and GFP expression levels (in mean fluorescence (MF)) are shown as means with SDs of three separate experiments. Asterisks denote significant differences between the untargeted or EGFR-targeted vs the CD40-targeted conditions in paired, two-sided t tests; Ad vs CD40-Ad, transduction efficiency, p = 0.011 and MF, p = 0.021; EGFR-Ad vs CD40-Ad, transduction efficiency, p = 0.0008 and MF, p = 0.011. The long-term effects of CD40 targeting of Ad on transgene expression and DC activation state were examined in DC migrated from explants, preinjected with plain medium without cytokines. Migrated cutaneous DC were harvested as before, but cultured in cytokine-free medium for an additional 5-day period. Transduction efficiencies and transgene expression levels for the different targeting conditions were comparable with those found immediately after migration, with similarly increased levels of transduction after CD40 targeting (Fig. 6⇓A). This demonstrates persistent expression of the transgene, both for targeted and untargeted conditions. However, CD83 expression, indicative of persistent activation, by this time was only found on DC transduced by CD40-targeted Ad (Fig. 6⇓A). Moreover, this persistence of maturation corresponded with the ability of DC to prime allogeneic T cells in the MLR (Fig. 6⇓B). To also demonstrate the ability of these DC to activate specific CTL, we made use of an Ad vector encoding the Haeminfluenza M1 matrix protein (Ad-M1). At this late time point after migration, DC infected in situ by CD40-targeted Ad-M1 had the ability to specifically activate autologous CTL recognizing M1-derived epitopes (measured by IFN-γ release in an ELISPOT assay at specific frequencies of about 100/100,000 CTL), whereas DC infected by untargeted or EGFR-targeted Ad-M1 did not (measured specific frequencies <10/100,000 CTL); see Fig. 6⇓C. In situ CD40 targeting of Ad prolongs maturation and T cell stimulatory ability of cutaneous DC subsequent to migration. Skin explants were i.d. injected with plain medium, cultured on rafts during 24 h, and then injected with medium, 108 PFU of untargeted, EGFR-targeted, or CD40-targeted Ad-GFP or Ad-M1, and placed directly in culture medium; 24 h later, the explants were removed and DC cultured for 5 more days in cytokine-free culture medium. A, The DC were labeled with PE-conjugated isotype (iso) mAb or CD83 mAb, and analyzed by FACS for GFP and CD83 expression levels. Transduction efficiencies (in % GFP+ cells) are listed. The shown experiment is representative of three. B, The DC were tested for their T cell stimulatory ability in an allogeneic MLR at the indicated ratios with responder lymphocytes (PBL). Results from one experiment of two are shown. C, Mock-infected (medium), untargeted Ad-M1 (Ad), CD40-targeted (CD40-Ad), or EGFR-targeted (EGFR-Ad) Ad-M1-infected DC were tested for their ability to activate M1-specific CTL. Results are shown as means from two independent IFN-γ ELISPOT assays from different donors. The used stimulator cells were either wild-type vaccinia virus-infected autologous MoDC or E7 peptide-loaded T2 cells (control, open bars) or autologous MoDC infected by M1-encoding vaccinia viruses or M1 peptide-loaded T2 cells (M1, closed bars). In this study, we have demonstrated a more selective and enhanced transduction of cutaneous DC through the targeting of Ad to CD40 in situ. This transduction was accompanied by an increased and prolonged activation of DC subsequent to migration. DC infected by untargeted Ad were found to acquire a T cell nonstimulatory phenotype over time, which in vivo might ultimately lead to a transgene-specific T cell unresponsiveness. In contrast, CD40 targeting of Ad appears to ensure the ability of the transduced DC to specifically stimulate T cells for at least up to 1 wk after transduction. Immunization by the use of replication-defective Ad vectors encoding specific TAA has resulted in CTL-mediated tumor rejection in murine models (2, 16). However, in vitro studies with MoDC have shown relatively low Ad transduction efficiencies (20–30%) (26, 27, 28). We previously showed that this is most likely due to the absence of the primary Ad receptor (i.e., CAR) on the DC surface (21). Only at extremely high virus titers (multiplicity of infection >1000) or in combination with liposomes can this relative resistance to Ad infection be overcome (26, 27, 28). However, the in vivo use of such high numbers of virus particles may be prohibitive due to considerable cytopathic effects on non-APC. Indeed, i.d. injection of Ad vectors and of DNA plasmids, or their delivery through the gene gun approach, has been reported to result in massive uptake of the vectors and expression of the Ag of interest by skin fibroblasts and keratinocytes (4, 7, 9, 10, 29). However, not these cells, but small numbers of DC, migrating out of the skin and ending up in the T cell areas of the draining LN, were shown to be responsible for the subsequent induction of both Th and CTL responses (7, 8). Theoretically, these DC could have been directly transfected or could have taken up apoptotic fragments from transfected keratinocytes or fibroblasts expressing the Ag of interest (a process known as cross-presentation or cross-priming) (7, 30). Both mechanisms have been shown to occur subsequent to genetic vaccination (4, 7, 8). However, Kurts et al. (11) reported that, in the absence of inflammation, uptake of exogenous Ags from non-APC by DC and subsequent presentation to CTL in draining LN could lead to the deletion of specific CTL clones. In addition, it has been proposed that the transfected keratinocytes, directly functioning as nonprofessional APC, might induce tolerance. In the context of these two latter scenarios, it is important to develop methods to selectively transfect and properly activate DC in vivo. Through our approach of CD40-targeted Ad transfer after cytokine-induced maturation of cutaneous DC in situ, both these conditions are met. At the same time, lower dosages of Ad can be used, thus eliminating cytopathic side effects while ensuring an optimal therapeutic efficacy of the vaccine. In vivo targeting of Ag to DC provides an attractive immunotherapeutic alternative to the laborious ex vivo generation and Ag loading of autologous DC, followed by adoptive transfer. Immunotargeting of protein Ags to APC without a further need for adjuvants to induce humoral immune responses in vivo was previously described using such targeting molecules as MHC-II (31, 32, 33) and Fc receptors (33, 34). Targeting to more DC-restricted markers, such as CD11c, was shown to induce even stronger responses (35, 36, 37, 38). A number of advantages adhere to our approach of combined GM-CSF/IL-4-induced maturation and CD40 targeting of DC in situ, as discussed below. GM-CSF has been reported to enhance the number and maturation state of DC at the site of administration, leading to a more efficient Ag presentation and T cell-mediated tumor rejection in vivo (39, 40). The in vivo induction of a higher DC maturation state through the administration of IL-4 in addition to GM-CSF has also been reported (41). Indeed, several reports suggest the importance of IL-4 in the differentiation and maturation of DC (42, 43); without it they may become maturation resistant and acquire a T cell-tolerizing capacity (43). Although injection of medium alone already induced sufficient levels of CD40 expression to observe an improved transduction efficiency through CD40 targeting, the observed additional increase in maturation and migration certainly warrants the in vivo use of the GM-CSF/IL-4 cocktail. GM-CSF- and CD40-mediated maturation does not impair endocytotic processes in DC, as evidenced by their reported maintained ability for cross-priming (44). This also suggests a continued ability to take up Ad-conjugate complexes. This is indeed confirmed by our data, revealing even higher transduction efficiencies and transgene expression levels after in situ maturation of the DC through GM-CSF and IL-4 administration before Ad injection. Moreover, the DC matured by CD40-targeted Ad infection appeared to preserve appropriate processing pathways for CTL epitope presentation, as evidenced by their ability to specifically activate CTL against HLA class I-binding epitopes contained within the Ad-encoded transgene M1. GM-CSF and agonistic CD40 binding have been reported to enhance the survival of DC through increased apoptosis resistance (45, 46). This may protect them during migration and increase their chances to encounter and activate specific T cells in the draining LN. Previous studies reported spontaneous migration of DC from skin explants after 48 h of culture (22, 23). We observed a significant increase in this migration by the i.d. injection of GM-CSF and IL-4. GM-CSF had previously been shown to stimulate the migration of DC from the skin to LN (39, 47). Although IL-4 was recently reported to hamper migration of Langerhans cells (48), we actually observed an increase in migration after the administration of IL-4 in combination with GM-CSF. Our results further demonstrate that the Ad-transduced DC retain their capacity to migrate. Nor did the binding of the Fab anti-CD40 conjugate impair migration, which is in keeping with previous murine studies (24). Indeed, an essential and regulatory role of CD40-CD40L interactions in the in vivo migration of cutaneous DC transporting Ag to the T cell areas in the LN was recently reported (49). In this context, our use of an agonistically binding Ab may ensure appropriate DC migration. That this may be the case is further supported by our recent finding of high transduction efficiencies (68–91%) of CD1a+ DC migrated from skin explants that were cultured for 48 h subsequent to injection with CD40-targeted Ad-GFP, contrasting with relatively low percentages (5–10%) of Ad-transduced cells among the CD1a+ nonmigrated DC derived from dermal single cell suspensions from the same explants (de Gruijl et al., unpublished data). These numbers suggest a selective migrational advantage of DC following their in situ transduction and activation by CD40-targeted Ad. Our finding that CD40-targeted Ad transfer leads to preservation of the mature and T cell stimulatory phenotype of DC for up to 7 days after the start of migration suggests that it may be an effective vaccine delivery system for the generation of strong antitumor responses. In contrast, migrated DC infected by EGFR-targeted or untargeted Ad had lost their CD83 expression and no longer stimulated allogeneic T cells after 7 days. Over these 7 days, we also found the DC infected by CD40-targeted Ad to retain the ability to activate CTL specifically recognizing the influenza M1 transgene, whereas DC transduced by untargeted or EGFR-targeted Ad did not. This is in keeping with a recent study by Hawiger et al. (50), who showed that targeting of a model Ag to the DEC-205 receptor on murine DC led to specific T cell unresponsiveness within 7 days after immunization, but that this unresponsiveness could be overcome by the coinjection of a CD40 agonistic Ab. The increased activation of DC effected through CD40 targeting of Ad, possibly coupled to enhanced survival and stability of the mature phenotype, may also account for the more effective CTL-dependent tumor rejection we previously observed in a mouse model, involving the adoptive transfer of DC, transduced in vitro by CD40-targeted Ad encoding the model TAA HPV-16 E7 (51). Other studies also revealed a key role for CD40-mediated DC activation in the generation of tumor-specific CTL and Th1 responses (52). This may in large part be due to CD40-induced IL-12 production, which we observed previously in MoDC after CD40-targeted Ad transduction (21). Similarly, Rea et al. (26) reported a synergistic enhancement of IL-12 production by simultaneous Ad infection and CD40 stimulation. In conclusion, CD40-mediated DC targeting in situ increases the number of Ag-carrying and migrating DC and ensures a long-lived activated phenotype of the DC for optimal T cell stimulation. Based on our findings, we propose a vaccination approach whereby i.d. injection of GM-CSF (possibly in combination with IL-4) primes the DC at the vaccination site for subsequent infection by CD40-targeted Ad vectors, encoding a TAA of choice. We thank Dr. R. B. Karim (Plastic Surgery Department, Slotervaart Ziekenhuis, Amsterdam, The Netherlands) and M. Broekhuizen (Van Goyenkliniek, Amsterdam, The Netherlands) for providing us with skin samples. ↵1 This work was supported by The Netherlands Organization for Scientific Research (NWO) Fellowship 901-10-116 (to T.D.d.G. ), and by National Institutes of Health Grants R01 HL67962, P50 CA89019, R01 CA86881, and U19 DK57958 (to D.T.C.). ↵2 T.D.d.G. and S.A.L.-d.B. contributed equally to this manuscript. ↵4 Abbreviations used in this paper: TAA, tumor-associated Ag; Ad, adenovirus; β-gal, β-galactosidase; CAR, coxsackie-adenovirus receptor; DC, dendritic cell; EGFR, epidermal growth factor receptor; FSC, forward scatter; GFP, green fluorescent protein; HPS, human pooled serum; i.d., intradermal; LN, lymph node; MoDC, monocyte-derived DC; RT, room temperature; SSC, side scatter.